Eric created this sign out of Alaskan spruce. It was commissioned by Bear Ridge Bed & Breakfast in Alaska. 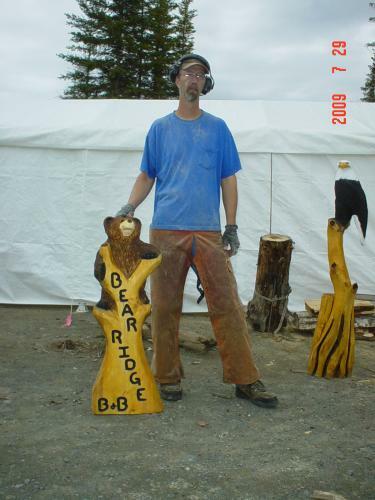 The carving was fun to create because there was the challenge of meeting the space requirements for Seward as well as the placement of the bear, the tree, and the lettering. The client was very pleased with his chainsaw-carved sign. Wouldn't this cute bear sign look great in front of your business door? A client in Dutch Harbor, Alaska commissioned this one-of-a-kind chainsaw-carved sign to commemorate the last Chief of Dutch Harbor. She had seen a similar sign Eric created for another business and fell in love with the concept. So, she called Eric and asked him if he would create this piece for her to place in front of her business. 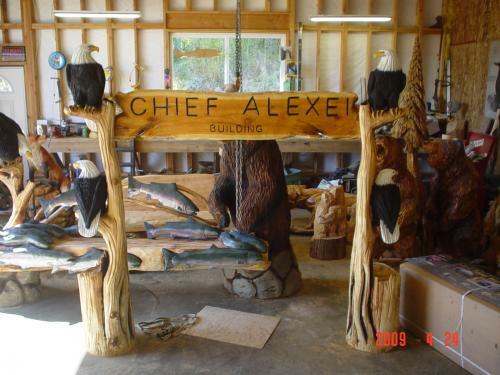 The sign is created out of three carvings: the sides of the sign each are a double eagle tree and of course the lettering portion is another carving created with the chainsaw. This sign stands six feet tall. 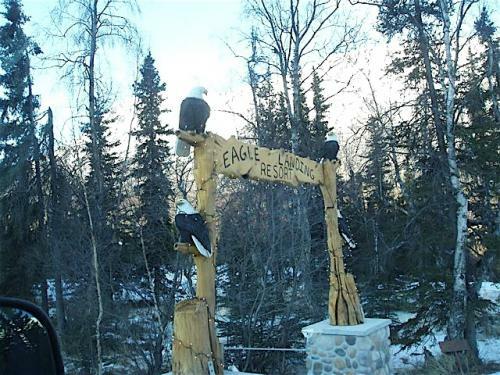 Cooper Landing, Alaska, is one of the hottest tourist destinations on the Kenai Peninsula. One of Eric's clients owns a resort right in the heart of Cooper Landing and their property sits on the bank of the Kenai River. The owners asked him to create a unique sign that would really draw attention to their fabulous resort. The sign, a ten-foot tall chainsaw-carved sculpture of two double eagle trees and hand-crafted lettering, has indeed drawn a crowd in the year that it has been in place. Eric's clients told him this summer that people stop at the end of their driveway ALL the time to take pictures with the sign. They have been tremendously pleased with their investment in advertising. When Eric's daughter was in pre-school, she attended a Montessori school. The owners asked him to create a unique sign for the school so that people would always be able to find them, even though the school is off the beaten path. Eric decided to create this sign to resemble the drawings that many of the students did while in class. The garden concept evolved from the idea that as the youngsters' minds are cultivated, so does their love of learning, and thus creates life-long learners. Therefore, Eric wanted to create a lasting garden for all the children to admire--no matter the season. 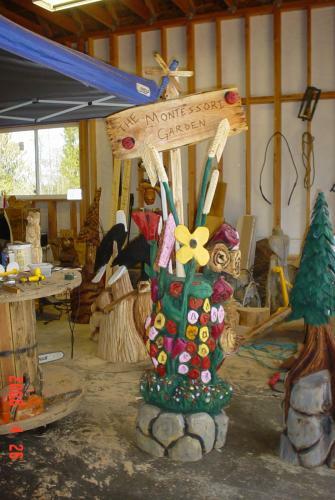 This Montessori Garden chainsaw-carved sign stands approximately 5 and a half feet. This is another example of the kind of sign one could have at their home or business. 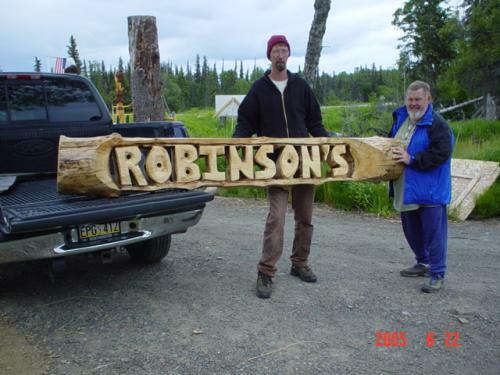 This Robinson chainsaw carving is approximately five and a half feet long and was created out of Alaskan spruce. After the passing of Eric's father-in-law, he and his wife Jennifer decided to rename the business in honor of her father because her dad loved walking and working in his woods so much. Since Eric creates beautiful artistic pieces out of wood, they thought this would be a perfect way to honor Jennifer's father. So, Eric set to work on the sign. While a simple design, it truly sets the tone for what Eric hopes to build. 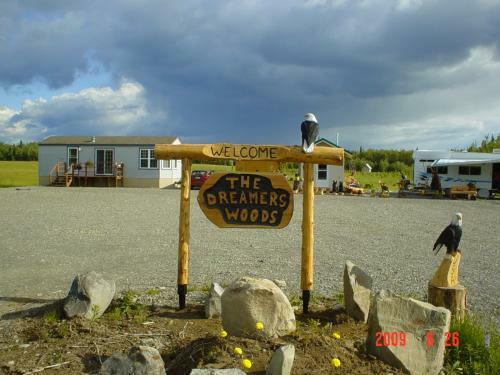 The Dreamer's Woods is the place to dream and to have dreams carved into reality.